Let Us Form a Ring is the original Acorn Hill Anthology and anyone who has used it can testify to the happy richness these songs and games bring to children. This is truly a classic collection. The collection is organized by season, celebrations and daily rhythms and is a treasure worth its weight in hugs and kisses. This Waldorf classic is brought to life in this audio CD set. A full 87 songs are portrayed with loving care and gentle beauty. 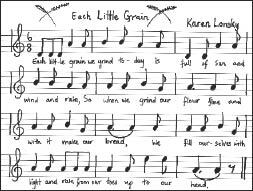 This is a beautiful way to learn the songs so that you can share them with the young children you love. Dancing as We Sing is the second Acorn Hill Kindergarten anthology. It includes Daily Songs to use each day to introduce circle time, snack time, story time, and the end of the morning; Seasonal Circle Plays for circle time throughout the year; and Traditional Singing Games that have been longtime joys for children. Nancy Foster has added introductory commentary to these three basic sections which offers her experience in using the songs and games in a Waldorf kindergarten. Just reading through this collection makes me feel like I'm back in the kindergarten - what a delight! All 67 songs from the book recorded beautifully as a learning aid for teachers and parents. Lorraine’s clear, soothing voice is full of warmth, making her CD a real listening pleasure—and not just for children. Ranging from reverent to wonder-filled to whimsical, many of the twenty-five songs are oriented toward nature and the changing seasons. All are simple and beautifully arranged, with piano, accordion, harp, or guitar accompaniment. Waldorf-inspired favorite songs, including: Come Follow • Morning is Come • Mother Earth • A Basket Full of Nuts • Come Little Leaves • Michaelmas • Tatus • High and Blue the Sky • November • When Mary Goes Walking • Glimmer Lantern Glimmer • The North Wind Doth Blow • Oh Where Do You Come From • The Mitten Song • Wee Dwarfs • The Owl and the Pussycat • Where are the Froggies • Spring is Coming • and more. Simply and beautifully arranged with harp, piano, accordion, or guitar accompaniment. Seven Times the Sun is a simply the best parenting book I've seen. Shea Darian's approach is radically different from any other I've found in print: where other's have offered considered, often good, advice, Shea sprinkles the magic of stories, songs, simple rituals whimsy and celebration into daily life, then seasons this mixture with quiet times and a few parenting tips for helping your child feel secure. The result? As you bring her gifts, one after another into your life and especially into that of your children, you'll find your home becoming a happy place to live, a place where all of you -- children and adults -- come to know you are loved, a place you all look forward to being in when away and are at peace with when you are there. This is an approach from the heart, for the heart. You'll find it's healing magic is just what you've always wanted. Here's a 'learning tool' that will make your heart sing as your voice sounds forth! Shea Darian is an accomplished musician with a voice that must cause the angels to bend nearer to earth whenever she sings. She created her companion CD as a way to share these simple songs with adults who may not have any musical training, but would like to learn these songs so they can sing for their children. As Shea says, "When young and old life our voices together as one, our ears and our hearts become more greatly attuned to one another. May these songs inspire moments of intimacy and joy!" You may also be interested in "Celtic Quest" by Avalon a cappella, a CD collection of songs by Shea Darian as well as traditional songs and performed by the Mary Thienes Schunemann, Shea Darian, Amy Chevalier, and Suzette Nelson. It's one of my favorites. This is simply a lovely book! Singing with babies and young children is one of the joys of being a parent - here is a collection of delightful songs that you and the children you love will enjoy equally. In The Singing Year, a companion to The Singing Day, you can follow the year in song and nature activites. The seasons and their special creatures and plants will practically dance their way into your hearts. Another treasure for parents and teachers, a gift to children! Long awaited, it will be long loved! Gesture Games for Autumn and Winter brings with it the same love and warmth of Ellersiek's Spring and Summer volume and her incomparable Giving Love, Bringing Joy. Anyone with young children in their lives will discover a new world of joy in Autumn and Winter - one with crackly leaves and crunchy frost, one with beauty all around. This beautiful book is a gift to children and the adults who love them - we warmly invite you to enter its world. These songs, hand gestures and movement games foster a joy and enthusiasm that leads our children toward a love and understanding of nature -- and no wonder, as they were created by the author of Giving Love, Bringing Joy. What an inspiring work! You'll love these as much as the children do. Beautifully performed songs from Gesture Games for Spring and Summer and Gesture Games for Autumn and Winter -- for you to learn to sing with the children in your care. Contains 19 songs of Spring/Summer and 18 Autumn/Winter songs. A beautiful way to teach yourself the lullabies, hand games and simple songs of Giving Love - Bringing Joy. Connie Manson sings all fifteen of of these very special songs with a simplicity and lilting grace that evoke the love we carry for our children. There's a bonus song, too! A Spanish language selection of gesture games taken from several of Wilma Ellersiek's books. Este libro ofrece una selección de varios ipos de juegos de gestos de mano: juegos de tacto y de movimiento rítmico, juegos de movimientos del mundo animal y para las estaciones del año, y gestos para acompañar canciones de cuna. Estos juegos están hechos desde un profundo conocimiento del ser humano y de las necesidades del niño en el primer septenio de su vida. En estos juegos viven la veracidad y grandeza de la naturaleze, la música en su sentido más amplio, yel arte de hablarle al niño en un lenguaje que es el suyo propio. El secreto del efecto saludable y terapéutico de los juegos de Wilma Ellersiek está en la armonía artística entre la palabra y el movimiento, que se crea a través del siempre presente elemento rítmico musical. Welcome to a world where song, celebration and play unite in a joyful festival of music and movement! Anna Rainville has brought an extensive collection of beloved singing games and plays together in one volume for all of us to learn, use and celebrate. In addition to the melody line score, she has added the warmest descriptions ever of how to dance, play and weave these songs into celebrations both large and small. The accompanying illustrations are little touches of love as well, and just right for each song they grace. There isn't a kindergarten or early grades classroom or homeschool, or a community potluck that wouldn't be infused with a delicious joy by the addition of any of these song games. That this songbook/cd set is now available is a gift to all of us. This lovely collection of songs became an almost constant companion when our children were young. We sang just about all of them -- some, like the lullabies, were heard every day; others, like the songs for Christmas, Michaelmas, Easter and the seasons, became hallmarks of joyous times and occasions. For sheer beauty and delight, and for songs that both children and parents love, Clump-a-Dump and Snickle-Snack is just the ticket! Let's Dance and Sing offers up some of the most beloved circle games of the Waldorf kindergarten. All of them tell little stories, some of them reflect fairy tales told during story time. The music is charming, engaging, memorable (the minute I saw these songs again, I started humming some of my favorites, so well did they live in my memory after nearly 20 years!). You'll love them, the children in your care will love them. A classic collection. Sweet songs for our young children - accompanied by soft and lovely watercolor paintings, just right for our little ones to gaze at. This is a collection that is little known in the United States -- the 32 songs are small, delightful, soft and sweet celebrations of daily life, nature and play. I'm sure you'll love them as much as the children will. There once lived a man whose head was filled with music - but the city was so noisy that he could barely hear the beautiful melodies. So he bought a house in the quiet countryside and invited other musicians to move in: the String family, the Woodwind and Brass families, a man with a piano, a harpist, and several percussionists. Soon sounds droned and groaned, thundered and rumbled throughout the house. This was not what the man had imagined. What was he to do??? What to say about this award-winning children's book, in clear and lovely English at last? That it is a captivating introduction to symphonic instruments? And music itself? It is - whether you are a child or an adult, you'll love it. I've started calling it "Peter and the Wolf for the 21st Century." That the musical score is a joy? It's true - Michael Rüggelbert has captured the personality of each instrument (and the challenges of getting some of them to get along with some of the others!) with such insight and humor that I felt warm and smiley all the way through the CD. That the story is wonderful? It's more than just that, actually. It's very, very human. Just as orchestra instruments each have their own very distinctive voice, and it is indeed an art make them harmonize with each other, so it is with all of us. The authors of The House Filled with Music understand well that the human comedy goes from cacophony to joy only with a lot of listening, some silence, self-control, skill, and effort. This is a story that children love and adults will love with them - priceless! And, there's more. The score is available (separately, from its publisher) for your school or community orchestra to perform! This is such an inspiration -- my hope is that in halls throughout North America, this story with its music will be played, loved, and played again. And in the meantime, you and your children or class can enjoy this musical story to your heart's content. *Yes, I know that Waldorf education does not encourage listening to recorded music, and I largely agree with the reasons for this. However, in the course of my life I have found that sometimes the delight we can share through such a recording is something to be grateful for, not shunned. This is the case with this CD -- it has my unflinching stamp of approval for children and adults. I promise it will spring rightly to life in your hearts -- do enjoy! Every nursery rhyme I've ever loved and sung to our children is here, accompanied Mary Thienes-Schunemann's soft, heart-opening voice on a learning CD. This is a beautiful collection of traditional children's songs and games - timeless, joy filled, life affirming. Today's children are starved for singing, just as they are for touch, story telling, and play. . . . This songbook is truly a treasure, one that should be in the hands of every parent, care-giver, and teacher. This book fills a critical need in American childhood (and parenthood) today! 62 pages, 8 1/2" x 11", Spiral Bound. Includes Audio CD. We've all been waiting so long for this songbook/CD - how wonderful that it is finally available! Mary has collected some of the best work & play songs that any child could hear of sing. Her crystal clear, soft voice carries any adult along as you learn them to share with the children in your life. Pete Seeger's contribution to this wonderful collection is an almost-too-good-to-be-true addition - yet another inspiration to 'make a joyous noise'! 52 pages, 8 1/2" x 11", Spiral Bound. Includes Audio CD. and bring her joy . . .
on the velvet of her face. - Antoine de Saint-Exupery "The City in the Desert"
The songs in The Sing a Song with Baby are indeed caresses - of laughter, the joy of discover, of head-to-toe delight and soft soothing wonder. Mary Thienes-Schunemann has created exactly the songbooks that I have for years heard adults who care for children begging for. This songbook offers up a feast of parent-baby games, bounces and joy - all beautiful and deliciously musical. It comes with a CD you can use to hear Mary sing all the songs in a voice so pure and simple it can bring tears (of joy and gratitude) to your eyes. And thus, in joy and beauty you can learn these songs and share them with your beloved children - who will bring your their giggles and squeals and joy again and again and again. At the time we ordered the songbooks from you, my new son was about two months old and Grace, my 2+ year old daughter, seemed to be doing the "big sister withdrawal" that older siblings sometimes do . . . The music, and the beautiful drawings, drew her in right away. Especially The Singing Baby, which incorporates so much play and touching, was just what we needed to reconnect. Of course, when she was avoiding physical contact it was really that she wanted it very much because she saw how much Luke was getting. This allowed us to get close again in a happy, fun way. 50 pages, 8 1/2" x 11", Spiral Bound. Includes Audio CD. Here are the songs mothers round the world use to grace their children at the close of each day. Mary Thienes-Schunemann has gathered lullabies from all over our dear planet, like glowing pearls on a necklace of love. This grace-filled songbook comes with a CD you can use to hear Mary sing - ever so sweetly - each lullaby in a voice so pure and simple it can bring tears (of joy and gratitude) to your eyes. And thus, in joy and beauty you can learn these songs to guide your children into sleep - and you can watch as your children smile into the arms of their angels. 39 pages, 8 1/2" x 11", Spiral Bound. Includes Audio CD. Many of us have been waiting (rather impatiently) for this latest songbook/cd set from Mary Schunemann. We've come to love what Mary can teach us about singing with children, and especially to love her magically clear, warm voice as she teaches us the songs we want to share with our little ones. Now she is giving us a delightful collection of songs in Spanish -- some of my very favorite children's songs in the world. When my own children were very young, we sang in as many languages as we could, but of all the songs we shared, it was the Spanish ones they asked for most. I think it was the joyous rhythms and happy rhymes -- and the fact that something in the songs set your feet to tapping and dancing. We all danced as we sang whenever we could. You'll love these as much as your children will. Thank you, Mary! 68 pages, 8 1/2" x 11", Spiral Bound. Includes Audio CD.